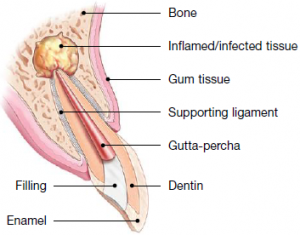 A root canal is necessary when the soft inner tissue, or pulp, of the tooth becomes inflamed or infected. This may happen because of deep decay, repeated dental procedures on the tooth, or a blow to the tooth. Endodontic treatment removes the damaged pulp. Then the tooth’s canals are cleaned and filled to help preserve the tooth. In a few cases, however, nonsurgical endodontic treatment alone cannot save the tooth. In such a case, your dentist or endodontist may recommend surgery. Surgery may be used in diagnosis. If you have persistent symptoms but no problems appear on your X-ray, your tooth may have a tiny fracture or canal that could not be detected during nonsurgical treatment. In such a case, surgery allows your endodontist to examine the root of your tooth, find the problem and provide treatment. Sometimes calcium deposits make a canal too narrow for the cleaning and shaping instruments used in nonsurgical root canal treatment to reach the end of the root. If your tooth has this “calcification,” your endodontist may perform endodontic surgery to clean and seal the remainder of the canal. 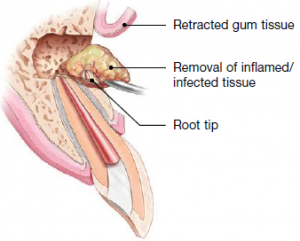 A small filling may be placed to seal the end of the root canal, this is termed “retrofilling,” and a few stitches or sutures are placed in the gum to help the tissue heal properly. 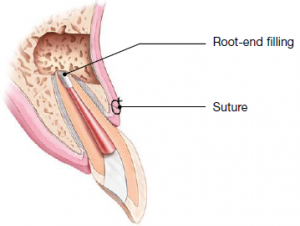 Other surgeries endodontists might perform include repairing an injured or damaged root, or even removing one or more roots. 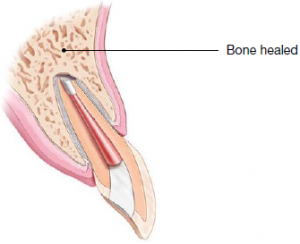 Your endodontist will be happy to discuss the specific type of surgery your tooth requires. In certain cases, a procedure called intentional replantation may be performed. In this procedure, a tooth is extracted, treated with an endodontic procedure while it is out of the mouth, and then replaced in its socket. These procedures are designed to help you save your tooth. Local anesthetics make the procedure comfortable. Of course, you may feel some discomfort or experience slight swelling while the incision heals. This is normal for any surgical procedure. Your endodontist will recommend appropriate pain medication to alleviate your discomfort. Your endodontist will give you specific post-operative instructions to follow. If you have questions after your procedure, or if you have pain that does not respond to medication, call your endodontist. Your dentist or endodontist is recommending endodontic surgery because he or she believes it is the best option for you. Of course, there are no guarantees with any surgical procedure. Your endodontist will discuss your chances for success so that you can make an informed decision. Though endodontic surgery is intended to help save your tooth, this is not always possible. Occasionally, the only alternative to endodontic treatment is extraction of the tooth. Missing teeth can make you self-conscious, affect your ability to bite and chew, cause other healthy teeth to shift and have a negative impact on your overall health. For these reasons, the extracted tooth should be replaced with an artificial one. Though nothing looks, feels or functions exactly like your natural tooth, dental implants are a viable alternative to help you maintain a beautiful smile when a tooth must be removed. No matter how effective modern tooth replacements are, nothing is as good as a natural tooth. You’ve already made an investment in saving your tooth. The reward for choosing endodontic surgery could be a healthy, functioning natural tooth for the rest of your life.